Humans are visual creatures. A visual is processed 60,000 times faster than any form of text, and studies show that 65% of the population is composed of visual learners. Moreover, 90% of the information transferred to the brain is visual. Marrying digestible text with striking visuals provides the best results regarding the effective presentation of information, which in turn makes it easy for audiences to understand and retain data. This very notion is the core of visualization. In recent times, data visualization specialists have married information to high-aesthetics, taking advantage of humans’ natural affinity for beauty. When we are choosing the right data visualization type, the most important element to consider is if you’re offering people the opportunity to see insights they haven’t seen or experienced before and wouldn’t otherwise be able to decipher in written text alone. Exclusive Bonus Content: Need to create your own data visualizations? Download here the best data visualizations types you should know! Creators of effective visualizations understand our human predisposition for the visual, taking it one step further by adding interactive functionalities that capture the imagination while presenting critical insights in a way that is as inspiring as it is understandable. By scrolling, clicking, and moving the cursor over interesting data points, designers engage users on a deeper level and enable them to be a participant rather than a viewer alone, adding more meaning to the data discovery learning process as a result. Studies suggest that those who follow directions with illustrations perform 323% more efficiently than those who follow text-only directions, a testament to the power of visualization. To demonstrate, here we place the spotlight on 18 of the best data visualization examples from around the world. Whether static or interactive dashboards, these effective data visualization examples will serve as an inspiration for any data enthusiast. Once we’ve showcased our visualization examples, we’ll go back with a retrospective glance at the genesis of visualization and explore why it matters today more than ever. Quicker action: As mentioned, the human brain processes visual information faster than text-based information, which means that your stakeholders – internally – or your prospects – externally – will be able to digest fresh insights and take swift, positive action on them. Finding connections: By displaying data in an inspiring visual format, it will be far easier to spot correlations and find connections between your operations and your overall commercial performance. As a result, you can develop a management report that will enable you to gain the insights you need to make changes that have a positive impact on the business. Emerging trends: By curating your data dashboards and presenting it visually, you stand a greater chance of spotting the kind of market trends that you can use to evolve your efforts while boosting profitability and gaining an edge on your competitors. Fresh discussions: One of the most beneficial elements of visualization is the fact that it allows you to tell a story with your insights and, as a result, drill down deeper into specific segments of information. By utilizing your own dashboard storytelling efforts, you will be able to spot fresh insights and spark up new discussions based on the growth, development, and direction of your business. Moreover, with the use of inspirational, informational graphics, you’ll engage your target audience on a deeper level, encouraging the kind of online discussions that will boost brand awareness, expand your reach, and help you position yourself as a thought leader in your field. Now that we’ve outlined the clear-cut benefits of visualization, let’s explore our 18 best data visualization examples from experts around the world. The first of our interactive data visualization examples will be this clean, simple interactive diagram that displays the results of Transparency International’s Corruption Survey data. Bold red makes the results pop out immediately. This visualization uses icons instead of words to communicate the different sectors included in the survey, making the presentation very visually appealing. Transparency International shows the viewer the relationships between the geographic location of the country and the type of corruption, leaving the audience to draw their own conclusions. We had a hard time rounding out our list. Instead of going for the super useful, we picked the most interesting: Matt Daniel’s Largest Vocabulary in Hip Hop. 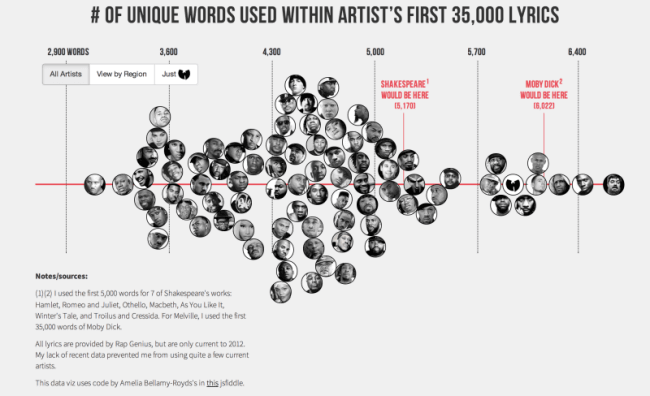 Matt explains, “Literary elites love to rep Shakespeare’s vocabulary: across his entire corpus, he uses 28,829 words, suggesting he knew over 100,000 words and arguably had the largest vocabulary, ever. I decided to compare this data point against the most famous artists in hip hop. I used each artist’s first 35,000 lyrics. That way, prolific artists, such as Jay-Z, could be compared to newer artists, such as Drake.” While the result may surprise you, it is a reminder that a good online data visualization tool does more than present information – it tells a story. This project is studying the way people take self-portraits in different parts of the world – over 120,000 selfies from Berlin, New York, Bangkok, Sao Paolo or Moscow have been analyzed. Are women more likely to take selfies than men? In which proportion? Do people smile, tilt their head, crop the picture? All these questions have been answered and the results are displayed in very well-made interactive data visualization examples. The complexity of the study and the insights found made it a real challenge to expose the results, which they addressed very well, creating one of the best data visualizations of the past years. Another good visualization pictures the link between increasing segregation of schools in Pinellas County in Florida and poor performance of students. 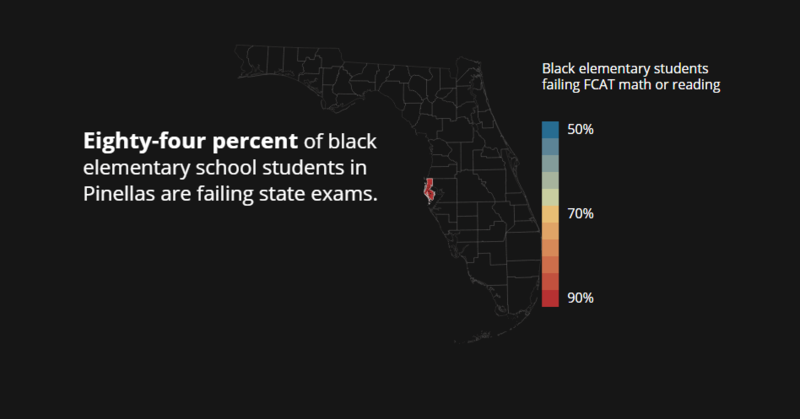 The visualization displays the results of an investigation carried out by the Tampa Bay Times on the basis of data gathered by the Florida Department of Education and Pinellas County School District. The results are strikingly accurate and clear. They reveal five out of 150 elementary schools in Pinellas County where students’ performance is exceptionally low. The underperforming schools are located in black communities’ areas with highest levels of social segregation. These insights can move local decision-makers and social activists to take better care of the troubled institutions and introduce improvements. Users scroll, not click, to see charts change and follow the investigation step by step. The scroll action is the new users’ favorite which is particularly fit for the mobile user. On Facebook, Instagram or Twitter we scroll through streams and streams of content. Scrolling engages users for longer and makes it difficult to look away. The view transitions easily from chart to chart, making the story easy to follow, and making the data itself central to the view on the screen. The data and results collected are complex and prolific, which made this data viz a real challenge, but they managed it so well and easy to understand, that we deem it to be one of the best interactive data visualizations that we came across. Cholera is a bacterial infection of the small intestine that causes its victims to suffer from such severity of diarrhea and vomiting that they can die in two hours. It’s fatal in half of the untreated cases. When the disease arrived in London, in 1832, it was thought to be spread by a “miasma” or bad smell in the atmosphere. There were four major cholera outbreaks in London over the next twenty-two years. Dr. Snow set out to track where people died and the nearby water sources. 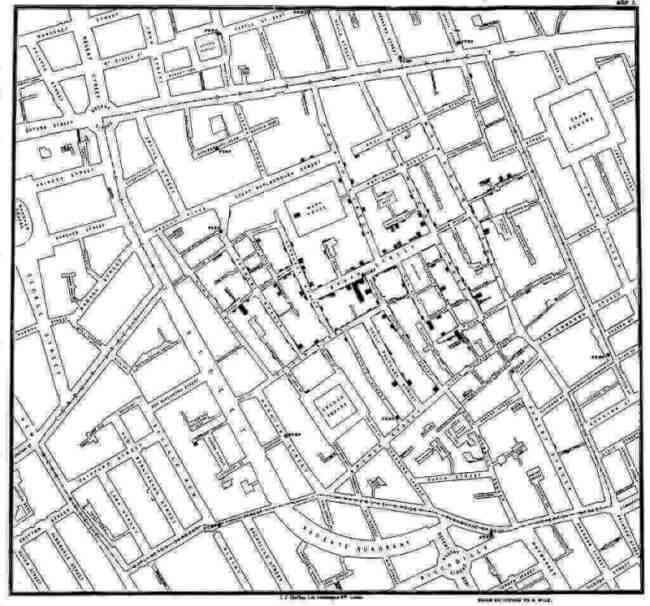 His map not only solved the source of cholera, but is one of the first (and most well-known) visualizations. Dr. Snow simply put a dot on a map to indicate where people died of cholera. He found that almost all deaths had taken place a short distance from the Broad Street water pump. It was discovered that “houses much nearer another pump, there had only been 10 deaths — and of those, five victims had always drunk the water from the Broad Street pump, and three were schoolchildren who had probably drunk from the pump on their way to school.” There were several other anomalies that helped prove his theory. There was a pump nearby where only five out of 530 residents came down with cholera – it turned out they had their own well. The seventy employees at a nearby brewery made it through the epidemic unscathed; they were provided free beer and didn’t bother drinking water. The final piece of the puzzle arrived when Dr. Snow was alerted to the death of a woman who had not been in the SoHo area. When the deceased woman’s son informed him that his mother liked the taste of the Broad Street well water so much that she had a servant fetch it each day, he knew his hypothesis was proven. It would take years for the rest of London to believe him. Worldshapin is one of the world’s most unique interactive data visualization. This dashboard creator takes several development factors for different countries and compares them in an odd, yet interesting way. The color-coded shapes on screen can be manipulated by dragging your cursor across a timeline, visually representing the changes different countries or geographic regions experienced over time. This easy-to-use graph is insightful and presents data in a fresh way, letting the user visualize the disparity between countries through interaction. Among the various interactive data visualization examples that we picked, this one is interesting when it comes to the huge amount of data it deals with. The Berliner Morgenpost’s EuropaKarte is a detailed map which provides viewers with detailed insights into the population growth and decline in Europe. Countries are divided into fields corresponding to geographical locations like cities, or even villages with less than 5.000 inhabitants. The fields vary in colors and their intensity, with vibrant orange symbolizing the biggest growth and dark blue the biggest decline. White means no change. When you move the cursor over a selected geographical field, you will see a pop-up with data including the name of the unit, the number of inhabitants and the growth/decline rate. You can also type the name of the location that interests you into the search box and find it easily. Moreover, you can use one of the filters to see which municipalities are growing/declining at the fastest pace in Europe or Germany or to view the list of countries with fastest growing/declining populations in total. The last filter will display birth rates of every country listed in descending order. This interactive infographic fits squarely into the current trend of geographical map visualizations, offered by datapine and some other visual analytics software providers. Are you a news junkie? This application organizes Google News’s top stories into color-coded category blocks. The size of each story depends on the number of related articles that exist inside each news cluster, so users can quickly identify the stories that receive the most coverage. Users can also filter their news by country and category, making it easy to find the stories that are important to you. Another good real-time data visualization example that shows the location and movement of trains, trams, buses and even ferries in real time. If you want to take a look at the whole city, from a longer distance, the map won’t be of much use. You will just see dozens of signs swarming around like angry ants. To fully appreciate this map’s usefulness you should use one of the filters – you can drill down to a street address, means of communication, lines, stops or stations to get a clearer picture. Moreover, if you zoom in, the map can also display taxis, car sharing, bike sharing and parking lots. If you are still not impressed, click on the icons. If you click P of the parking lot, the pop-up will appear with more detailed information like the number of vacant places or the price. On the other hand, if you click, say a taxi, you will see the car make, and accordingly: a bus – the whole timetable, same for a bus stop – the timetable of every single bus line that stops there. According to VBB (Verkehrsverbund Berlin-Brandenburg), the public transport authority covering the federal states of Berlin and Brandenburg, the visualization doesn’t reflect the bus location with 100% precision, because the data doesn’t come from GPS, but is calculated according to the timetables. So it can happen that a user will wait, freezing on a train station, expecting the train to arrive, but it won’t appear. However, if it happens that the train is canceled or it has a serious delay, then it will be taken out of the system. The added value of this kind of timetable is that it can show multiple information at a glance, so that you can decide which transportation will suit you most. The only drawback: the mobile application is so far available only for Android systems. The Dawn Wall is The New York Times’ best interactive data visualization on the astonishing 19-day free climb in Yosemite National Park in California. Tommy Caldwell and Kevin Jorgeson were the first daredevils ever who completed a breathtaking climb up the mostly smooth granite face of El Capitan, widely considered to be the most difficult free-climb in the world. A free-climb means that ropes are used only to catch a climber’s fall — not to aid the ascent. Visualization complements the story, weaving organically into the narrative and helping the user to picture the scale of this venture. While at first glance, this health infoscape seems overwhelming, a second look will show that it is worth the bounty of information it presents, making it one of the most effective data visualization examples we’ve seen to date. By gathering data from over 7.2 million electronic medical records, General Electric created an entertaining presentation about the prevalence of health symptoms and the symptoms commonly associated with each other. With pleasing colors and multiple ways to view the relationships, this makes looking at unpleasant symptoms quite enjoyable. Big Mac Index, popularized by The Economist, compares the prices of a Big Mac burger in McDonald’s restaurants in different countries. Why this particular product? Big Mac burger represents a standardized product that includes input costs from various areas, such as agricultural commodities (beef, bread, lettuce, cheese), labor (blue and white collar workers), advertising, rent and real estate costs, transportation etc., and therefore is representative of the general state of the local economy. 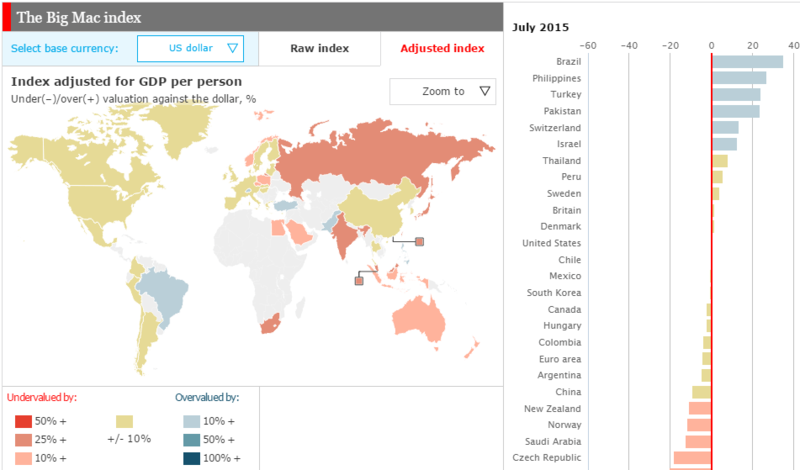 The Big Mac Index is a real-time data visualization example that shows whether currencies are at their “correct” level. It is based on the theory of purchasing-power parity (PPP), the notion that in the long run exchange rates should move towards the rate that would equalize the prices of an identical basket of goods and services (in this case, a burger) in any two countries. For example, the average price of a Big Mac in the Euro area in July 2015 was $4.05 at the market exchange rate, while in the United States it was $4.79. It means that Big Mac in Europe was undervalued by 4.4%. Scatter chart at the bottom displays the local price of a Big Mac (expressed in the current base currency) against GDP per person in that country. When you move the cursor over individual data points for details, you will see information like GDP per person and Big Mac price in a chosen currency. When you click on the particular country on the map, the scatter chart will be replaced by a line chart displaying the selected country’s under- or over-valuation against the current base currency over time. It turns out that all great minds don’t quite think alike, and this is masterfully showcased in this example that uses key insights from the book “Daily Rituals” by Mason Currey. 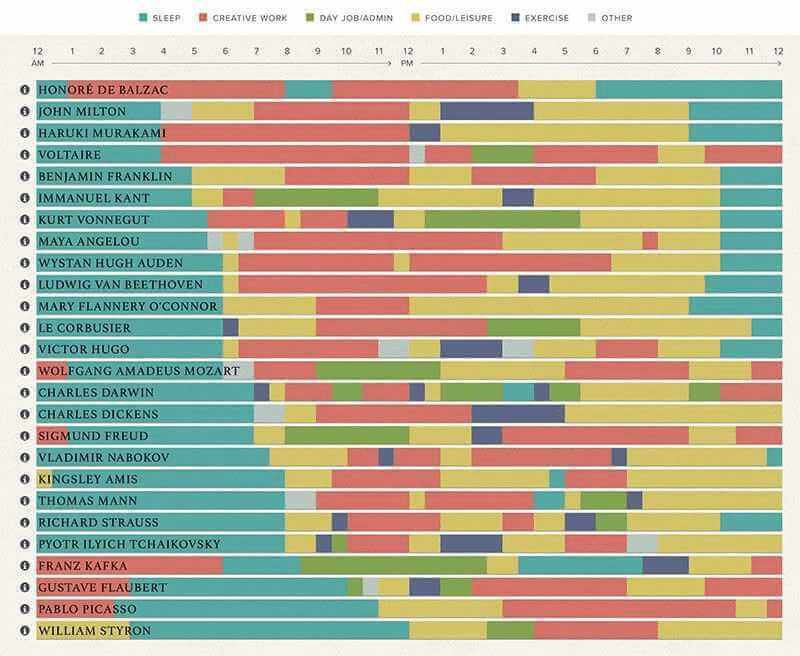 Offering audiences a detailed reflection of the daily habits, rituals, pursuits, and priorities of some of history’s most prolific creative minds, including the likes of Benjamin Franklin, Maya Angelou, and Franz Kafka, Daily Routines is one of the most entertaining data visualization examples on our list. By using a simple color-coded bar chart format, Daily Routines’ creator makes it easy for people to compare the daily lives, habits,, and rituals of these iconic creative geniuses and drill down into the very pursuits that help these individuals thrive during their lifetimes while comparing one to another. Simple, striking, effective, and informational, this is certainly one of the best data visual examples in existence, and its message is as engaging as it is informational, offering key insights into optimizing our daily routines for enhanced success. Thanksgiving is without a doubt one of the most widely observed annual holidays in the US, with 54.3 million people traveling across the country to spend time with their loved ones last year alone. Back in 2015, when around 46.3 million people traveled far and wide for Thanksgiving, tech colossus Google used its internal talent to create one of the best interactive data visualization examples we’ve seen to date. Powered by Google Trends, this aesthetically stunning piece of interactive content offers a glimpse into the flights moving to, from, and across the USA the day prior to Thanksgiving Day. Not only is each flight color-coded by the airline, but this short movie-style visualization has transformed flight-based metrics into a piece of art that shows the path of each flight in action. Without displaying any numbers or flight metrics other than the time, viewers can see which segments of the day are the most popular for different types of flights – a testament to the value of effective data visualization. When considering the best interactive data visualization, it would be impossible to exclude this creation from Setosa. 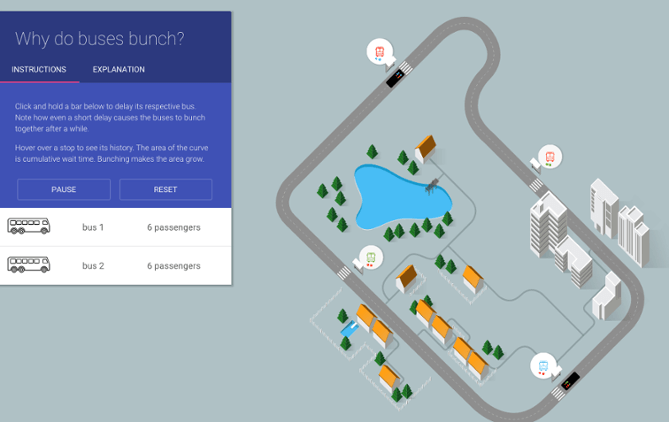 In a bid to show travelers why buses ‘bunch’, or in other words – why services experience delays or disruptions that cause several buses to arrive at a bus stop simultaneously, the company developed this almost game-like piece of interactive data visualization comprised of complex data sets. Upon the realization that telling the story by numbers would be messy and far from engaging, Setosa put the wheels in motion to produce a visual that used the data to give users a chance to cause delays and watch scenarios unfold while gaining an insight into how many passengers are affected by disruptions. A glorious example of numerical metrics transformed into something that is accessible, engaging, and informational for everyone. 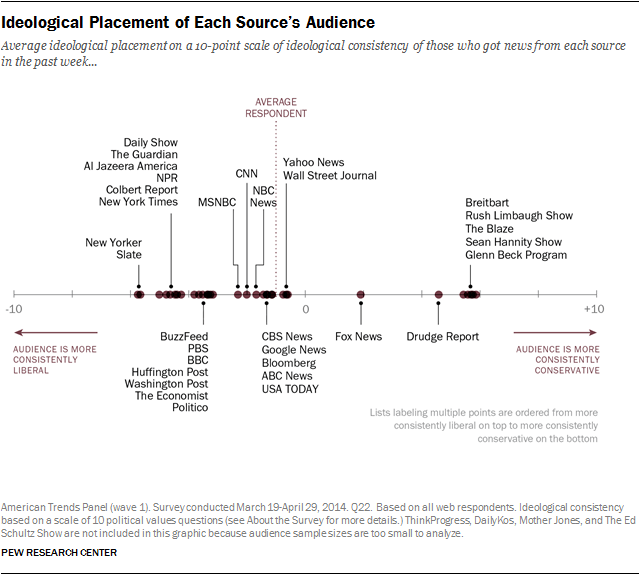 A noteworthy data visualization example from the Pew Research Center, this brilliantly presented static graphic showcases the current political spectrum and helps the reader to decide where their personal ideologies fit in comparison to the thoughts, opinions, and preferences of different media outlets, programs, and publications. Not only is the table-style visual neat, professional, and easy to digest; it takes a specific set of metrics and offers a great deal of personal value by allowing the user to determine where their beliefs lie in comparison to others. 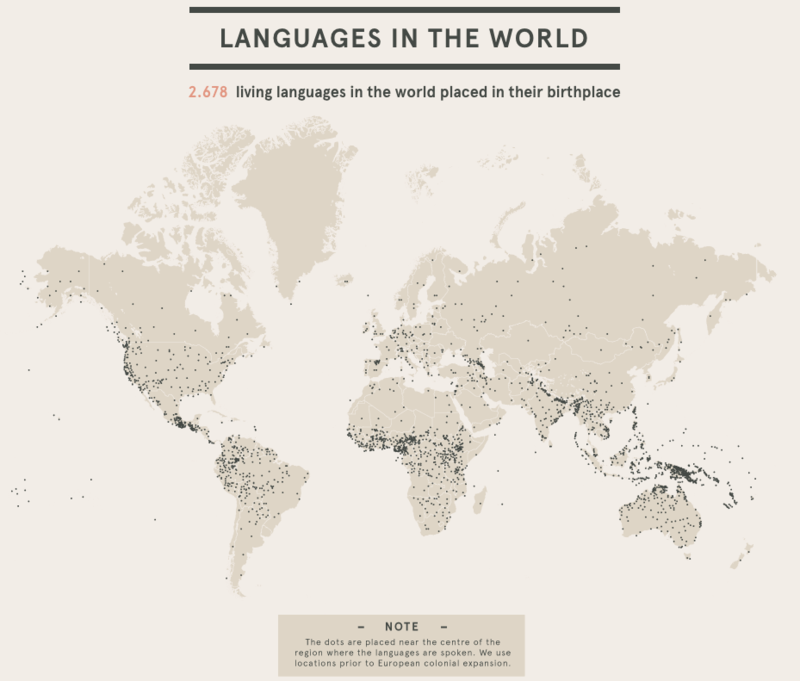 The penultimate of our best data visualizations, this sensational graphic from Density Design offers a quick, easy, and engaging way to understand the number of languages that exist on the planet, where they’re spoken, and who speaks them in different pockets of the world. Produced for the non-linguist, this data visualization example is easy to navigate and simple to break down. It serves up a level of insights that inspires, educates, and acts as an incredibly useful resource for those researching languages in a number of fields and industries. An impressive and creative feat of visualization. In the final spot of our rundown of the best data visualizations, we’re going back in time to glance at Napoleon’s Invasion of Russia. Drafted by civil engineer Charles Joseph Minard in 1892, this is perhaps the earliest recorded data visualization example and still one of the best visualizations to date. Not only does this infographic-style visualization offer up vital insights in a digestible format, but this age-old and effective data visualization example proves that we as humans are truly visual creatures. The pioneering visual is regarded by many as the “greatest statistical graphic ever drawn” and while such a statement is subjective, it’s nothing short of inspirational. Combining six different data sets – geography, strategic movement, direction, the number of remaining soldiers, temperature, and time – this iconic visualization offers a tangible insight into Napoleon’s push into Russia, immortalizing an important historical moment in time for future generations to explore. Good visualizations are particularly important in business, where large volumes of data must be analyzed swiftly or presented in a clear and actionable format. The rows of numbers alone won’t create a story compelling enough to catch the audience’s attention. The goal is always to make the data behind your arguments look attractive enough to persuade the decision makers or enlighten your team members. With easy-to-use data visualization software more and more companies can create eye-catching visualizations on their own. Interactive interfaces make it possible even for non-technical users to create actionable charts. The type of visualization you select is guided by the kind of information you are seeking to convey. A fixed image is ideal when alternate views are neither needed nor desired, and when publishing to a static medium, such as print. Dynamic, interactive visualizations are best for empowering people to explore the data for themselves. Both have their advantages. When creating one, the purpose should always be to generate a certain level of excitment and engagement with the audience, for it to be the best visualization. 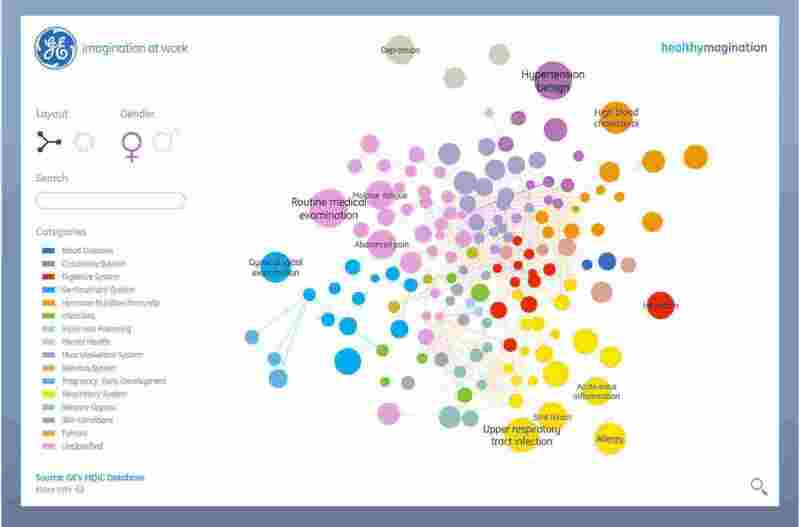 Interactive Data Visualization: What’s In It For Me? A layer of interactivity enables your audience to connect directly with your data, and offers a second axis to track information changing over time. Hans Rosling, famous data scientist and visualization Ted Talker is a huge proponent of showing time as graphic movement. Check out this video – The Joy of Stats – a perfect example of how combining time to your visualization enables the viewer to see trends. 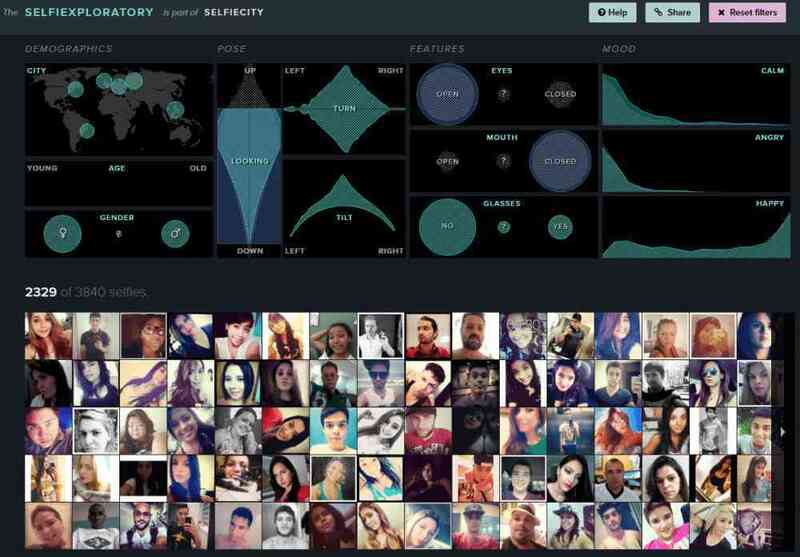 A trend we are seeing in all content marketing, not just visualization, is personal attention. From customized white papers to interactive ebooks, content is no longer a one-size-fits-all solution. Interactive visualization enables you to reach your audience on different levels by offering an ability to drill down into the data. Newcomers to the topic can still spot trends and learn the basics, while experts in the field can drill down deeper into the data for more insight. Content marketing is competitive. There is a lot of noise to push through before you can be heard. The best interactive data visualizations is a ticket into the spotlight. Let’s take, for example, USA Today’s interactive story “Behind The Bloodshed.” Mass killings dominate the American media. How can you compete with major prime time channels as a newspaper? USA upped the ante with this piece, particularly the interactive data visualization that enables the viewer to drill down on the mass killing timeline for details. The piece is informative, powerful, and emotional. Our selection of best visualization examples above demonstrate creative, innovative leaps that illustrate the changing way we see and interpret data. Everything is becoming personalized. People want to see how they fit into the big picture, where they stand on the shifting terrain. A real-time visualization example or some of the best interactive visualizations answer that need in two ways: giving the viewers control over what they see, and letting them narrow the data down to their personal situation, whether it is age, location, income or other factors. This is the beginning of a new phase of data personalization. In place of abstract headlines and generic pronouncements, readers will be able to project themselves into the dataset. With the best tools you can prepare the best interactive data visualizations for your business and on your own, within a few clicks and with no advanced IT skills needed. You can start visualizing your own data by exploring our software for a 14-day trial – completely free!